Nordic Ware’s microwave safe dinnerware is a perfect substitute for paper or plastic disposable plates and can be used time and again. Break-resistant, these are ideal for kids, too. Whether at home or on the go, you can feel good about reaching for these BPA and Melamine free products. This set of 4 party trays come in bright colors. Our prep and serve bowls are not only perfect for organizing ingredients while baking, but they are just the right size for serving small portions and match our party trays perfectly! Microwave safe trays are a perfect substitute for paper or plastic, disposable dinnerware. 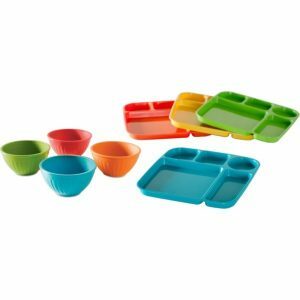 Trays and Bowls come in 4 matching bright colors. BPA and Melamine free products. Four 1-cup capacity prep or serving bowls are great for organizing ingredients for cooking or the right size for serving small portions or snacks. Microwave and dishwasher safe in top rack; Made in the USA.